​We support our Boy Scouts and the following: Contribute generously to the Second Harvest Food Bank, Interfaith Hospitality, Shalom Ministry, Crosswalk, CASA "My Bag" project, UMCOR, Crop Walk, Ogden Hall, Union Gospel Mission, Deaconess Children's Center, UNICEF, Children's Christmas Tree, and outreach to families in need. We are building a partnership with Mullan Road Elementary School to support hungry students through the Bite 2 Go program. Bite 2 Go is a partnership between the 2nd Harvest Food Bank, local schools, and community organizations. Each Friday, children in need are sent home with a Bite2Go Kit with food for the weekend. The Bite2Go kits include a good mix of healthy, kid-friendly, easy-to-open, single-serving, nonperishable food items to cover meals and three snacks over the weekend. The shelf-stable milk, juice, cereal, entrees and snacks are safe for children to handle on their own because they don’t require any cooking or other preparation. Each week, staff members at participating schools put the packages of food discreetly in the backpacks of students in need. Shalom Ministries and "Dining With Dignity"
We are a major partner with the ministry and work of Shalom Ministries and their Dining With Dignity meal program. 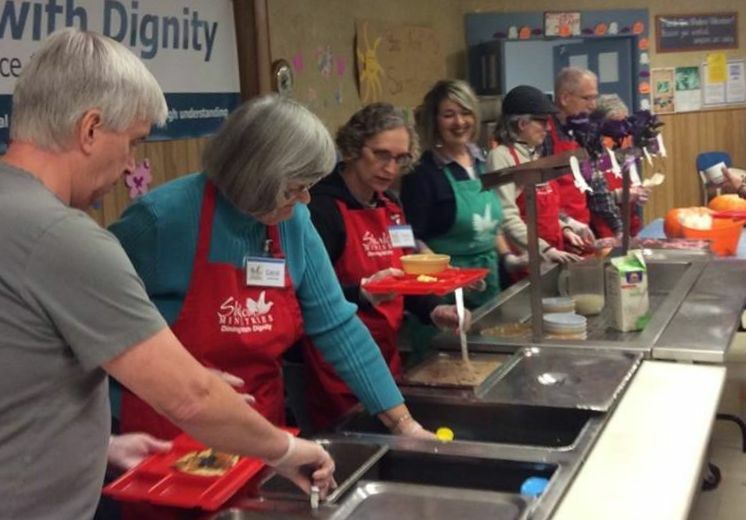 We are committed to helping to serve breakfast every Monday morning at 7:15am at Shalom Ministries, which is located in the basement of New Community Church (518 W 3rd Ave in downtown Spokane). We are always looking for new folks to come out to help serve on Mondays. Shalom Ministries shares their Mission Statement on their website (which can be accessed here): Shalom Ministries is a nonprofit ministry dedicated to providing wholesome meals and other services to the poor and homeless people within our community. We are committed to a system of excellence as we work with guests, team members, volunteers and the people we serve in a process that begins through the spirit of cooperation. During the first 10 months of 2018, Shalom Ministries served a total of 41,693 meals -- and expects to serve over 50,000 meals by the end of the year. This represents a significant increase over the 45,751 meals served in 2017, reflecting the growing homeless population of the Spokane region.